Humans normally have 46 chromosomes in each cell, divided into 23 pairs. Two copies of chromosome 6, one copy inherited from each parent, form one of the pairs. Chromosome 6 spans about 171 million base pairs (the building blocks of DNA) and represents between 5.5 percent and 6 percent of the total DNA in cells. Identifying genes on each chromosome is an active area of genetic research. Because researchers use different approaches to predict the number of genes on each chromosome, the estimated number of genes varies. 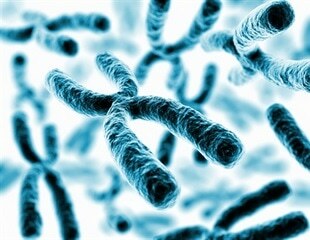 Chromosome 6 likely contains between 1,100 and 1,600 genes. Genes on chromosome 6 are among the estimated 20,000 to 25,000 total genes in the human genome.